What was your inspiration for your 'Retro' illustration style? Please explain the art era that you most influenced by. 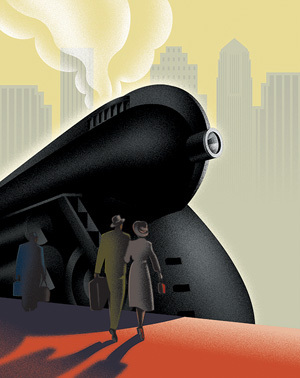 The WPA graphic style for posters was one inspiration. In addition, the Art Deco style was another, which has a more radical usage of geometricism, tension, and agitation from the juxtaposition of forms, fragmentation of images, abstraction, rationalization, as well as simplification. The art era I was most influenced by was the 1920's, 1930's, and 1940's. Is there a certain colour palette that you enjoy working with? I love working with the aged, faded 1930's poster colours, simply because they are more muted, in contrast to today's vivid and vibrant colours. What common everyday visuals influence your art? i.e. photography, sculpture, found art, movie graphics, comic books etc. 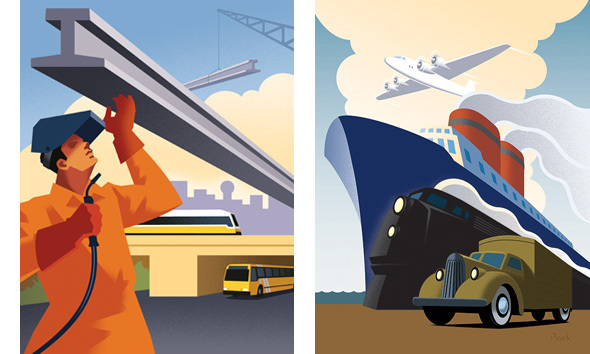 The common daily visuals that influence my works include the following: old travel poster books, old movie poster books, classic movies, and black and white photography. Does your graphic design sensibility of problem solving play an important part in your illustration work? Yes, it does. I create the work that grabs the attention and translate the raw idea into the classic retro environment or bold and simple approaches. Your commercial clients are wide and varied; do you also have a large client base for your fine art? Initially, I used to have a minimally small client base, but to this date, many come and go. Sometimes, I am able to work for a high-profile client, yet sometimes you may work for a small designer company. What can best describe your experience the year that you studied abroad in Florence, Italy? I see some influence in some of your illustrations. For one, it broadens my horizons; that is to say, my experience. At that particular time, I was able to study classical drawing and painting works while I was in Florence, Italy. With this in mind, I believe this has somehow influenced my classical figures, colours, and compositions. What is your philosophy about today's commercial art world, and how do you fit in? It's like classical music; it has never gone out of style. Likewise, with classic Coca Cola, it has never gone out of taste and remains so. So, for me to do retro art, it's always the trend, and that is how I fit in. In other words, from my viewpoint, what's classic is always new. What is your greatest passion over and beyond your artwork? I have a passion for black and white photography in either film or digital with Leica cameras. I love the look of the photos that leica lens gives. I also enjoys shopping at the flee-market and antique market. Have you won any recent awards or did recent works? Recently, I entered in the Graphis poster art competition for 2010 and surprisingly, I won a gold award for advertising in the poster category. 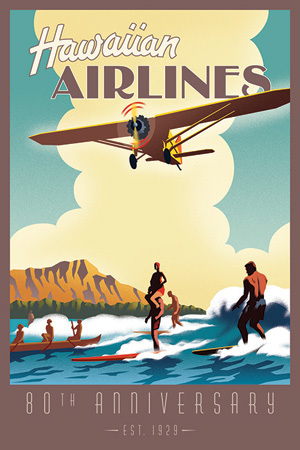 It was for a series of posters for the 80th anniversary Hawaiian Airlines.